This delicious recipe for short ribs cooked in a wonderful chili broth is from the cookbook Mod Mex: Cooking Vibrant Fiesta Flavors at Home . It is a very flavorful recipe and a perfect one for those who love authentic Mexican recipes. For the salsa, put the onion, garlic and tomatoes on an oiled baking sheet and roast them in the oven until the skins of the tomatoes are blistered and the onions are lightly browned and soft, 15-20 minutes. Remove and let cool. Toast and rehydrate the chiles in about 4 cups of water (see directions below). Reserve the rehydrating liquid. In the jar of an electric blender, combine the roasted vegetables with the chiles, 2 cups of the rehydrating liquid, salt and pepper. Purée until smooth. Set aside. Season the short ribs on all sides with salt and pepper. Heat a large, oven-safe pan on high heat. Add the canola oil and sear the short ribs on all sides until browned, about 2 minutes per side. Stir in the salsa and simmer for 5 minutes. Add 4 cups of the chicken stock, the oregano, the bay leaf and season to taste with salt and pepper. Bring the liquid to a boil, cover the pot, and transfer to the oven for 1 1/2 hours, or until the meat is very tender, adding more stock if needed to cover the meat. Remove the short ribs from the cooking liquid and strain the broth into a clean pot. Bring to a boil and reduce by a third, skimming to remove the fat from the surface. Return the ribs to the broth and keep warm. Toss the cabbage with the lime juice and season to taste with salt. Put 2-3 short ribs in a bowl. Ladle 1 cup of the broth over the meat, garnish with 1/4 cup cabbage and a sprinkle of cheese. Serve with warm tortillas and roasted garlic mashed potatoes. For dried chiles, pull of the stems and pull out the seeds. Cook the chiles in a hot, dry skillet until the skins blister slightly and you smell a toasty aroma. Let the chiles cook and then rehydrate them: In a small saucepan, cover the toasted dried chiles with water, bring just to a boil, remove the pan from the heat, and let them cool in the liquid for 5 to 10 minutes. If needed in pureed form, use tongs or a slotted spoon to transfer the chiles to the jar of an electric blender and puree, adding as little of the soaking liquid as necessary to make a smooth paste. Most Mexican food is not difficult to cook. The amazing flavors come from the wonderful blends of spices, herbs and chiles used in the recipes. The rich savory flavors in this recipe come from the combination of chiles, garlic and tomatoes that the ribs are cooked in. 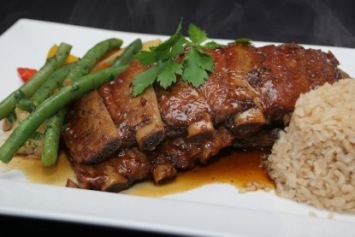 You will find another of our beef short ribs recipes here.